Months of concept designing, prototyping, custom laser cutting, hand carving, and mountains of sand paper later…..the Olive Tree has finally come together. 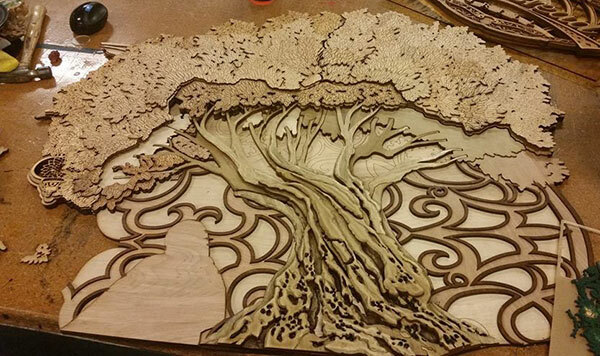 The tree and branches form the centerpiece of the largest component of the 9 piece commission. The trunk is to be lacquered while the leaves will be individually painted. The trunk was stained, sanded, stained again, sanded again in repeated, iterative layers. The final results are what I was hoping for. This was a tremendous amount of work. And to be honest…..I kinda underbid. But I think the client is really going to be happy with the final design.